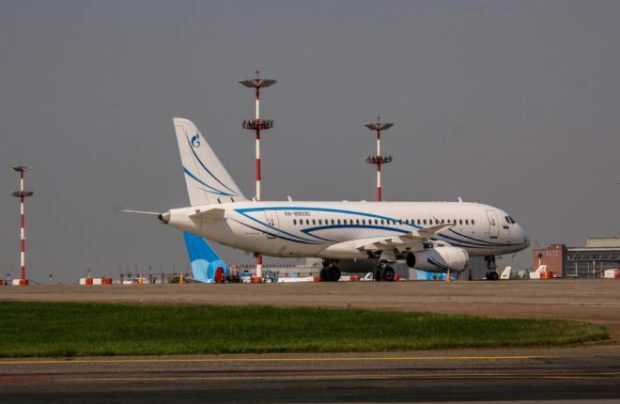 Gazprom Avia airline and S7 Engineering, a part of the Engineering Holding, have signed a one year contract that covers all maintenance operations on the carrier’s four SSJ 100LRs. S7 Engineering will perform 1С-, 1А-, 2А-, 4А-, 6А- и 2M-checks on the aircraft. The contract is an outcome of an open tender, the carrier’s owner, Russia’s gas monopolist Gazprom, said in a statement. The S7 Engineering competed against Kazan-based Tulpar Technic. Gazprom Avia has thus become the third SSJ 100 operator (after Red Wings and IrAero) that trusted the Engineering with maintenance of this type. The two companies’ previous cooperation on Soviet-built aircraft MRO has now been extended to the new-generation of Russian regional aircraft. Gazprom Avia operates a fleet of 10 SSJ 100s, but S7 Engineering will provide maintenance solutions on four of them – RA-89029, RA-89030, RA-89031 and RA-89048. “The basic package includes 1C-checks. All other types of work are included in the contract as optional and additional,” Engineering pointed out. Notably, 2016 saw three new independent providers entering the SSJ 100 MRO market. The third one besides Engineering and Tulpar Technic, is Volga-Dnepr Technics Moscow. Commenting on the growing competition in SSJ 100 maintenance segment, a spokesperson for Engineering said that the demand for these services still exceeds the offer. “Considering the growing number of deliveries and new orders for the aircraft, we are sure that we’ll have to expand our facilities for SSJ 100 maintenance in the future,” he told Russian Aviation Insider.